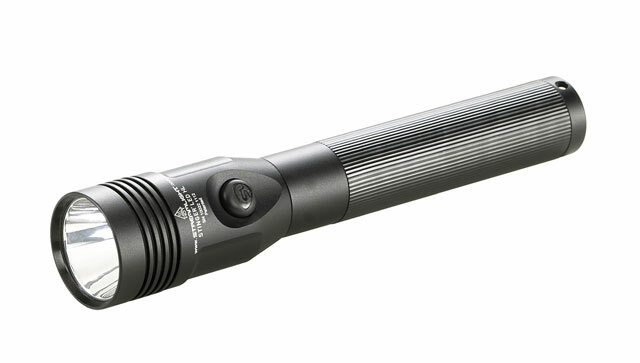 The Stinger LED HL features 640 lumens for more brightness and a wider beam that lights up a whole area, from side to side. You'll have full situational awareness when operating under low light conditions. The Streamlight Stinger® LED HL™ is everything you love about the Stinger with more lumens for more brightness and a wider beam that lights up a whole area from side to side. This powerful light gives hunters, shooting enthusiasts and other outdoor users full awareness of their surrounding environment when operating under darkened conditions. With a wide beam pattern similar to a flood light, it’s ideal for lighting up a trail, illuminating a campsite or searching under darkened condition. Featuring three microprocessor-controlled variable intensity modes, the Stinger LED HL delivers a blinding 640 lumens on high, 340 lumens on medium and 170 lumens on the low setting. On the high setting, the light provides 22,000 candela peak beam intensity and a beam distance of 297 meters, with a run time of 1 hour and 15 minutes; on the low setting, the light provides four hours of run time. Fabricated from 6000 series machined aircraft aluminum with an anodized finish, theStinger LED HL is powered by a 3-cell, 3.6 Volt Ni-MH sub-C battery, which is rechargeable up to 1,000 times. The light fits existing model chargers. Impact resistance-tested to 1 meter, it is also IPX4 rated for water-resistant operation. For more information, visit //www.streamlight.com/en-gb/product/product.html?pid=273.